Squadrons: 304 (Silesian) Sqn; 305 (Wielpolska) Sqn; 408 (Goose) Sqn; 61 Sqn; 106 Sqn; 1485 Bombing & Gunnery Flt; 1668 HCU; No. 5 Lancaster Finishing School; 1690 Bomber Defence Training Flt; 504 (County of Nottingham) Auxiliary Sqn; 22 FTS; 2 FTS; Central Gliding School; 643 Volunteer Gliding Squadron; 644 Volunteer Gliding Squadron. 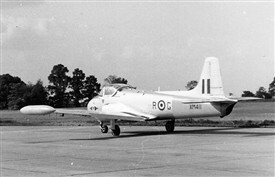 Aircraft: Battle; Wellington; Hampden; Lancaster; Martinet; Mosquito; Tiger Moth; Prentice; Piston Provost; Jet Provost; Viking glider; Vigilant motor glider; Venture T Mk 2. Current status: Some significant structures remain in day to day use on the western side of the A46; whilst a lot of the former quarters on the western side have fallen into disrepair. Some wartime structures can still be seen in the ground of the Flintham Hall Estate. 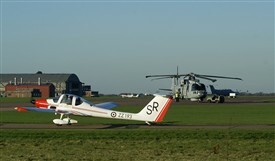 Gliding activities are a common sight on most days throughout the year – weather permitting. 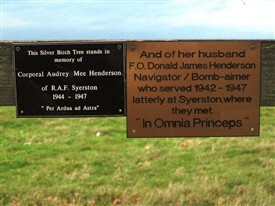 There is an aviation memorial/commemoration that can be visited on the airfield perimeter at Longhedge Lane. This page was added by Howard Heeley on 11/12/2014. I was at that display at Syerston in 1958 with my dad the Vulcan did a couple of circuits quite high then did a flypast down the runway and started breaking up in front of us. I'll never forget it, very sad. There's a photo of the same aircraft in the cafe at the parachute school at Langar aerodrome a few months before it crashed. It was very sad indeed; the incident is documented in Tim O'Brien's book about the airfield - I still think that copies are available from the Newark Air Museum shop.